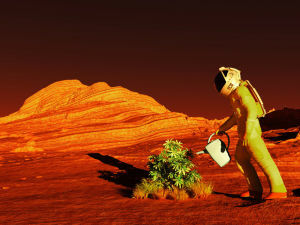 Newest publications and topics in regards to Life on Mars. Read about stories, mysteries and convenient advice when it comes to Life on Mars. Get the newest reports and publications on Life on Mars. Experts from NASA's research department have announced that in the future, people may be able to colonize the surface of Mars by inhabiting igloos. The Curiosity Rover's latest mission has registered methane gas, a waste product which only living organisms are capable of releasing. Following this logic, NASA astrophysicists believe that the discovery is proof of life on Mars. Of particular interest is the idea called Mars Mania. It can be traced back to Carl Sagan, who was adamant that if there is life on Mars, we humans shouldn't do anything with it. Mars belongs to the Martians, even if they are just microorganisms. NASA has found running water at a narrow and nearly 328 ft (100 m) long salty water flow. The news was announced by the American space administration at a press conference aired around the world. Scientists claim that they have found dormant and viable microorganisms in glaciers on Mars. Experts believe that after after being thawed, the organisms will come back to life. The expert on extraterrestrial anomalies Joseph Skipper claims that the figure on Mars, which was photographed years ago, is that of a woman.